Due to the site-specific location of Submarine Time Machine, there is no level access to this production. For audiences with level access requirements National Theatre of Scotland are providing an alternative experience of Submarine Time Machine in their new headquarters Rockvilla. See below for more details. 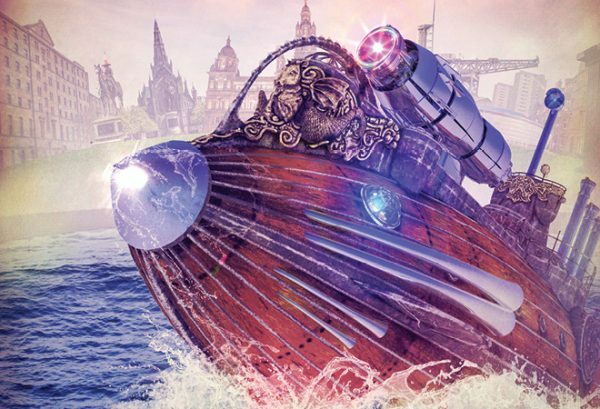 To celebrate the National Theatre of Scotland’s move into Rockvilla, a new facility for Scottish theatre-making on the banks of the Forth and Clyde Canal, the Company are delighted to announce Submarine Time Machine. Audiences of all ages are invited to participate in a free weekend of performance, art and myth-making, from a leading team of professional artists and actors working alongside local community groups. Submarine Time Machine is an, interactive, multimedia, theatre experience telling the stories of the canal as seen by mini submarine HMS XE9, whose final journey took it from the North Glasgow Canal Corridor to Rosyth in 1952. National Theatre of Scotland is working with local community groups, schools, residents and organisations to excavate the past and rediscover the myths of the canal, the secrets held by the submarine as well as the community’s hopes for the future. These myths, old and new, will be brought to life by a cast of a hundred on the towpath of the Forth & Clyde Canal, between Speirs Locks and Firhill Basin. They will recreate the fantastical stories through sound installations, dance, sculpture, football, choirs, music, virtual reality, an immersive submarine experience and the telling of the tallest tales. Access is via all canal entry points between Speirs Locks and Firhill Basin. An accessible solo video installation to emulate the Submarine Time Machine experience will be provided via Samsung 360 virtual reality in the Front Room of Rockvilla. Contact megan.mceachern@nationaltheatrescotland.com if you require further details.